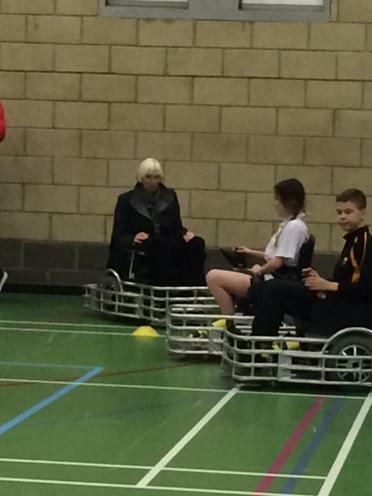 Just a short note to thank you for inviting Sue (Baroness Campbell) and I to join you at last week’s wheelchair hub event at Woodchurch High School. It was a terrific event and just wonderful to see so many young people taking part, enjoying themselves and gaining new skills and confidence through sport. We are delighted to be working in partnership with you, but both recognise what an awesome job you do in your local community and beyond, piecing together programmes, initiatives and funding streams into a strategy which aims to create something sustainable and transformational for children with special educational needs and disabilities. We don’t underestimate the blood, sweat and tears you put in – on behalf of all the young people you support, a very heartfelt thank you. I particular I was grateful of the conversations we had about the challenges and opportunities you face and how the YST ca best support you. We both also loved seeing the new YSD Wheelchairs in action and, as can be evidenced through the attached photo, Sue thoroughly enjoyed her ‘spin’ in a powerchair ! Thank you once again for allowing us to be a part of it all.